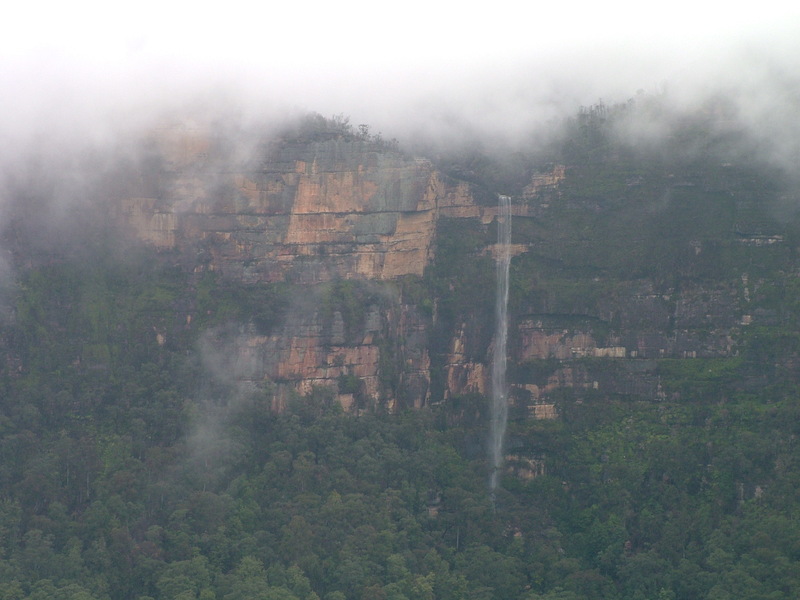 I visited the Blue Mountains for another writing weekend a few days ago, just the usual one night stay. It was my first visit since March. I become invisible up there. This bodes well for productivity: without having to worry about other people’s routines, expectations or needs I can get a lot of writing done. My writer self usually goes under the radar among other transients at my budget accommodation of choice, the YHA (Youth Hostel Association). On my March visit I remember patriotism dominating the conversation on the other side of my bedroom door, an Australian woman holding forth. Her impassioned speech about ‘our great country’ must have bored the rag tag group of backpackers gathered as much as it did me. Coming up here I am learning to be by myself. It is the easy tasks I find difficult when on my own such as settling on where to eat dinner, having decided early on in my visits to leave the shared cooking arrangements to the rest of the group. It is a fifteen minute drive to ‘town’ from the YHA. I like to check out the locals and see how they spend their weekend nights. On that March visit I settled on a little Thai place opposite the railway station, sandwiched between a take away pizza shop and a hippy clothing outlet. There was something cosy, homely about it that lured me in. Maybe the fairy lights winking in the front window and the smiling waitress were responsible. Though I was concerned about the rat traps peeking out from under a pile of magazines under the fish tank. I bought myself a beer from the bottle shop in the pub nearby and settled into reading my book while I waited for my meal. The grand sum of my stir fried vegetarian dish was $12. It wasn’t great by any means but it filled the gap. At around 9pm I returned to my humble accommodation to settle in for the night. Delicious cooking smells began wafting under my door from the open kitchen area. The doll-like young Japanese couple who had just arrived were preparing a meal. They were the final number of our party of strangers bedding down under the same roof. I was wishing they had cooked some for me! On this latest visit I chose a felafel roll from three cheeky Turkish brothers who run a Middle Eastern take away on the other end of the main street. They were keeping a shop chock full of customers entertained with their banter on this cold late autumn night. Politicians should stay at YHAs. They would witness first hand their shifting populations containing not only backpackers and folk looking for a night away from their own existences like me. They will meet the likes of Gary who calls himself a ‘professional house sitter’ and thinks he is professional at every other topic that you dare to mention, which is why I give him a wide berth. There is no oxygen left in the room when Gary is around. He knew why I was up there by our 2nd meeting. ‘So you are the writer. You should show me your stuff to read’. Not on your life Gary. You will no doubt be an expert on that too! The pollies may also catch Chris who moves from YHA to YHA with his stack of newspapers and other reading matter he has collected on his many train journeys. This is how he fills his days since his car accident. My host Carol* tells me his collection takes up the entire surface of a hostel bed. She was in a quandary on one of my visits, trying to determine who she could ask to share with if she had any late comers. Gary and Chris were low on the list given that Gary probably talks in his sleep and Chris needs space for his ‘collection’. I recall driving back from one of my library writing sessions and seeing Chris’s precious cargo on the line waving like tattered flags marking his arrival: underpants and t shirts that he had hand washed in the laundry sink in the bathroom. On this May visit I encountered three Germans in their mid-twenties who had already bunkered down for a week and marked their territory with groceries from one end of the 12 seat dining table to every available surface in the common area. A frypan full of cooked pasta and mushrooms sat on the gas cooktop. It had hardened over time and was there to greet me when I arrived late afternoon and again the next morning as I was leaving. The domestic chaos on this last visit belied the perfect picture of early morning mist and gum trees framed by my window that I woke up to the next day. And Kookaburras arguing loudly in their staccato dialect. Still the Germans were nice enough kids, inviting me to partake in pizza with them at 10pm the night before when I had run the gauntlet of the dining area in my pyjamas to use the bathroom. And they’d had the courtesy of introducing themselves when I first arrived. I also registered a cheesy smell the next morning. The culprit was the left over pizza from last night’s eating and drinking frenzy sitting in the middle of the table. Large empty bottles of Heineken were the only new additions to the domestic detritus from the day before. The school prefect in me took photos on my phone to send to Carol, who I knew would be mortified. There is an element of trust tied to our $A28 per night tariff, which had certainly been breached on this occasion (I stopped short at telling her about the extra person they had accumulated for the night, making theirs a tribe of four). Drains were blocked in the bathroom, they’d almost run out of toilet paper and hadn’t told our manager at the top of the drive. It was how I would imagine having a sleepover with my son and his friends would be, though my son is not yet at legal drinking age. And as much as I miss him when I am away, I had left him behind for a reason. A handful of YHA members use the address as their ‘official’ address which really annoys Carol. But she adds soberly this is a close as some of them get to a fixed abode. When I arrived at the main house to check in, she shared with me an experience she had one Christmas: a homeless woman had come to stay and share in the festivities with her sister’s family who lived in the area. Carol gave her a few lifts into town when she herself was heading that way. But the woman became so abusive on one occasion that Carol had to drop her mid-way to their destination for fear of either being physically attacked or having a car accident. Turns out this woman was schizophrenic and also hadn’t been taking her medication regularly. Her own sister ended up turfing her out of her family gathering on Christmas Day due to her violent behaviour. YHAs are not for the faint hearted. I am always humbled by the experience and grateful for the life on Sydney’s fringe that I have briefly left and know I will soon return to. I salute people who run them, providing shelter and human contact for many, including those of us with nowhere else to go.